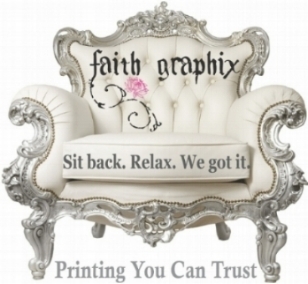 For a quick quote, please complete the form below or email us your requirements with or without your print files to: info@faithgraphix.com or simply give us a call at 262.997.4815. PAPER: Please indicate: type of paper, such as gloss or uncoated, and weight of paper. If you are not sure, please describe what you need the best that you can. For example: "Like the weight of a business card, or the weight of a magazine." INK COLORS: Please be sure to specify if the sheet prints on ONE SIDE or BOTH SIDES. Also, is there tight register, bleeds or heavy ink coverage? COATING - Please indicate if you would like varnish, aqueous, lamination, or U.V. coating. BINDERY: Please indicate if you need folding, perfing, die-cutting, etc. For folding, please indicate the flat size and the final folded size. Please provide as much detail as possible as to how it folds. SOFTWARE: Let us know what type of file you will be sending for print. TURN-AROUND TIME: If you know specifically when you need your job delivered, please give us as much information as possible. ART DESIGN: If you need your project to be designed, we will need a detailed list of what you would like to be created. We will then quote you on our graphic design charge. If your files are over 20MB please go to (click here>>) www.wetransfer.com to send your large files to info@faithgraphix.com for free. Please Note: All pricing based on print ready digital files - additional charges will apply for any file manipulation. Complete the information below with as much detail as possible. 24 hour turn around response to your quote request - Our Promise to You!